Should I Begin My Yard Project in the Fall Or Spring? You can have all the right tools, the best intentions, and a solid plan for your yard project, but if you begin in the wrong season it could be doomed from the start. 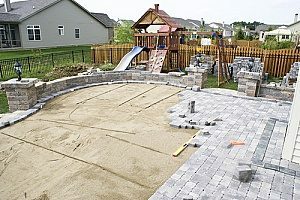 You must consider what kind of project you’re working with and if it should start in the fall when the temperatures are colder and the dirt is drier, or if your project would have more success in the spring with the rain and warm weather. This is particularly important when you’re working with topsoil and fill dirt. Below are examples of a few types of projects and what time of year is best to start them. This can help give you an idea of when you should start your project. In terms of construction, land grading is a construction process in which land is leveled or sloped to form a base, typically called for when a foundation is needed for a building. Land grading can also be used to correct drainage problems, prevent flooding, level backyard space so the area is more useful, or terrace a property’s hillside yard. Conducting a project like land grading might have more success in the spring, especially if you’re trying to fix rainwater drainage problems. This is because you need to pay attention to how rainwater is currently draining from your yard and where it’s collecting in unwanted places. Wait for a rainstorm that creates water flow in your yard. When the rainstorm is over, walk around your yard and take note of where the water is pooling. This can be done sticking a stake or other marker into the ground. Wait an hour and then check the points you have marked again. If the standing water is still there, then this is a low point in your yard where the water is draining to. To fix this problem you need to place enough fill dirt in the low point to make it level with the high point. The fill dirt that has been placed will change the level of the slope and prevent water from pooling where you don’t want it to. If you’re doing this project in the spring, you can finish your land grading by adding a thin layer of topsoil on top of the fill dirt so that new grass can grow. If you’re looking for a new project to start on in your backyard, look no further than a floating deck. Floating decks aren’t extremely hard to build as long as your willing to put in the time and effort to ensure that each step is done properly. A floating deck can add a simple, elegant design to any backyard while also creating usable space for things like outdoor furniture and grilling. 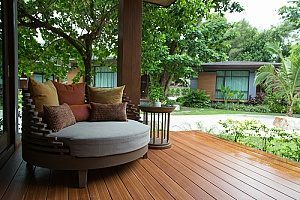 Building a floating deck is only going to require a couple of materials which include fill dirt, blocks, deck boards, and nails. You’ll find that starting this project in the spring will be far easier for you because the ground will be softer and more malleable. This will make the crucial step of leveling the ground for your floating deck much easier. First, you need to remove any grass or rocks that may be in that area. Next, you have to deal with the dirt that is left behind. Only a lucky few are going to have this naturally occurring flat yard that is stable enough to support a floating deck, so it’s very likely you’re going to require the assistance of fill dirt. To create level ground you’re going to have to determine what height is “level”. Then, you have to cut away any dirt that is above your level height. Following this, you should fill in any low points with fill dirt so that they reach the level height. Next, you’re going to take fill dirt and cover the entire area the deck is going to be resting on. A good inch or so of fill dirt should do the job. From there, you’ll have an incredibly sturdy base for you to build your floating deck on top of. Above ground, pools are usually seen as a more affordable alternative to an inground pool. One primary reason is that they don’t require the commitment of having a huge hole dug up in your yard. Above ground pools also aren’t as difficult to remove, and that can make them very advantageous to some people. However, despite the benefits, the appearance of an inground pool can sometimes be more desirable than an above ground one. Rather than dishing out a lot more cash to get an inground one, you can simply get the appearance of one by having an above ground pool surrounded by fill dirt. Unlike the other projects previously mentioned, this project is requiring you to build on top of the ground rather than having to dig into it. Because of this, you’ll find this project much easier to do in the fall season when the ground is drier and more compact. You’ll want to use the fill dirt to build up around the edges of the pool to create your desired look. When the springtime rolls around, you might want to add some topsoil so that grass can grow on your fill dirt and make it look more natural. If you’re starting your garden for the first time, beginning the project in the early spring is going to give you the best success. The weather conditions at this time of year will allow your new plants, vegetables, or flowers to flourish from the topsoil you planted them in. If plant new seeds in the fall, you’ll have a very hard time getting anything to grow, since the seeds aren’t well suited to withstand colder temperatures. Building a garden can be simple or as complex as you’d like. 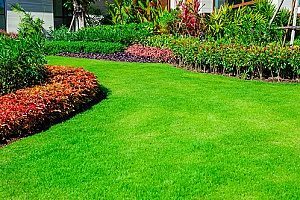 It can simply involve clearing a patch of your backyard and placing down some topsoil, or it could involve taking more time to consider what the overall appearance and style you want your garden to be. Before taking on the challenge of a new yard work project, reach out to a Virginia fill dirt contractor for more information and to schedule your fill dirt or topsoil delivery. They will ensure you have the right type and quality of dirt or soil you need to make your project successful.